Terrestrial aquatic environments cover about 2% of the Earth’s surface (Wetzel, 1983, Limnology (767p). Philadelphia, PA: Saunders College Publishing House). However, this small percentage of surface coverage act as important sources of drinking water and sustains biodiversity. The UN estimates that by 2050 there will be an additional 3.5 billion people with most of the population growth in developing countries which already suffer water stress. Climate change could have significant impacts on water resources around the world because of the close connections between the climate and hydrologic cycle. Studying the possible impact of climate on these water resources is thus of primary importance, and on-going research is being made at multiple levels: neo-ecology (studying the actual functioning of these ecosystems), palaeoecology (studying how these ecosystems have functioned in the past) and modelling (predicting their future functioning under climate and anthropogenic influences). 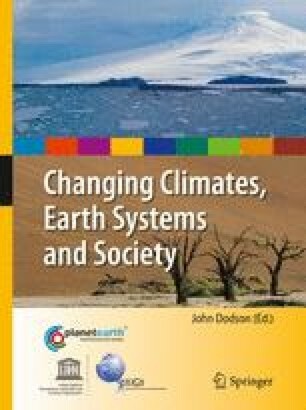 Although this chapter is mainly concerned with the past functioning of these ecosystems, a synergy between these three research levels is necessary to better comprehend and estimate the impact of climate change on water resources. An effort is thus made to include some aspects of neo-ecology and modelling of past, present and future terrestrial aquatic environments (Fig. 1). Lakes can act in two ways to help better understand climate change and its effect on terrestrial aquatic ecosystems: (1) they contain multiple indicators which can be used to quantitatively reconstruct climate (e.g. temperature, precipitation, atmospheric circulation). Although the global temperature seems to have increased in the last century, the regional and even local climate can vary, and might be more important for the management of water resources. Only by looking at the climate variation through time at regional and local scales can we better understand and predict the future climate and its impact on water availability and biodiversity. (2) when linked with independent records of climate change, multi-proxy analysis in lakes can provide insight on the possible impacts of climate on water resources. For example, by linking the historical reconstruction of total productivity of various biological assemblages preserved in lake sediments and the meteorological data of the last 200 years, Korhola et al. (2002) have shown that these changes were due to climate warming. This chapter will look at how climate can be reconstructed using proxies preserved in lakes and second how climate has impacted these ecosystems in the past and how it might impact terrestrial aquatic ecosystems in the future.